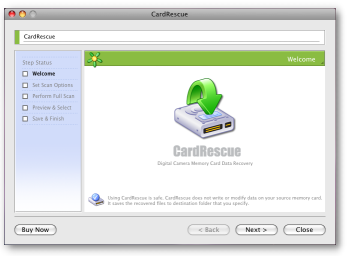 Download CardRescue Evaluation Version to perform a quick scan on your memory card and see the recoverable pictures. 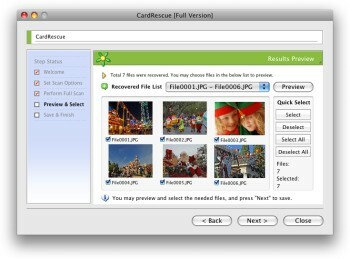 CardRescue is a photo recovery software for Mac. The free evaluation version will allow you to scan the memory card quickly and find the recoverable pictures. Also, you may preview the found pictures before purchase. Uninstall: CardRescue does not install any files to system folders. So uninstalling CardRescue is easy and you may simply remove CardRescue.app from your Downloads or Applications folder. Using CardRescue is secure and risk-free. The software does not write anything to or modify the data on the flash card. It rescues the photos from the card and saves them to a folder on your hard drive.